Han Solo assembles a team of spacers to defend a group of settlers. On Aduba-3, Han Solo gets in a bar fight, then listens to the proposition of a group of farmers, who every year are raided by Serji-X and his Cloud-Riders, who steal their livestock, burn their crops, and take their wives and daughters. Though they can't pay him much, they'd like to hire Han to defend their town from the raiders. Han agrees, on the condition that he can hire some additional help. 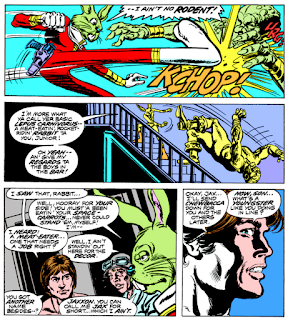 Han interviews prospective candidates, assembling a team of eight (including himself and Chewbacca, as well as the carnivorous rabbit named Jaxxon) to confront the Cloud-Riders. Meanwhile, Luke Skywalker departs Yavin 4 along with the droids, tasked with scouting the galaxy for a new Rebel base. Back on Aduba-3, Han and his team are confronted by Serji-X on the outskirts of the space port. Serji-X offers to pay Han to walk away, but he refuses, and Serji-X flies off, declaring Han will soon be one more lifeless corpse twisting in the desert wind, as Han tells his team of Star-Hoppers to mount their banthas and head out for the village. This issue introduces a ton of new characters, six of whom become Han's "Star-Hoppers" in the course of the story, as well as the villain. 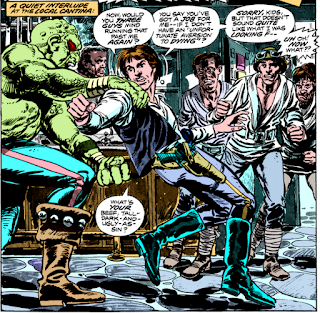 First, there's Hedji, an alien whom Han refers to as a Spiner, who can hurl spikes from his body. Then there's Amaiza, a blaster-wielding bad girl who has a past with Han. Next is Don Wan Kihotay (say it out loud...), a disillusioned old man who believes himself to be a Jedi Knight, and whom Han brings on board mostly out of pity. There's Jimm, the Starkiller Kid, a naive, yearning-for-adventure type in the vein of Luke (which Han comments on) and his companion droid Effie. 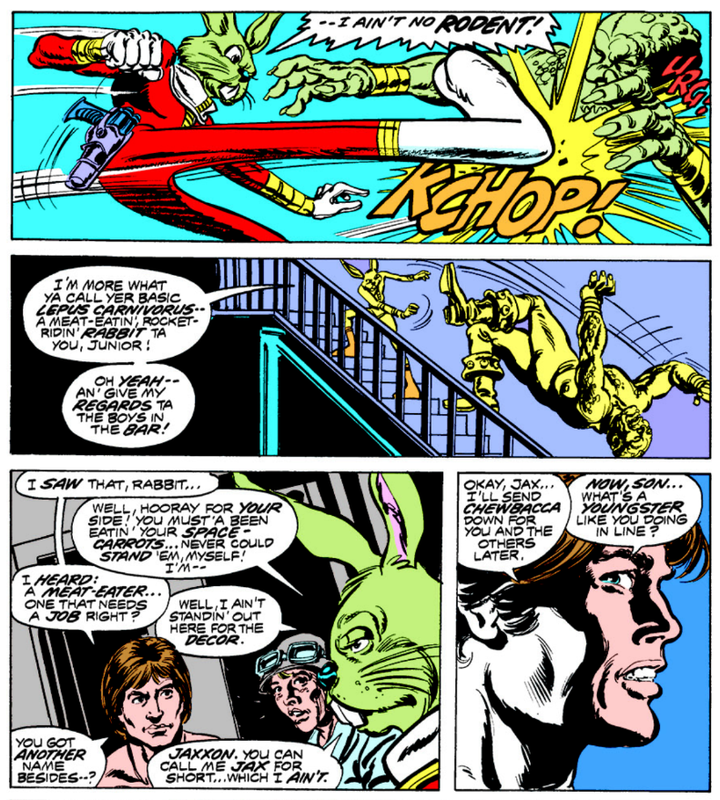 Finally, there's Jaxxon, perhaps the most (in)famous of the characters introduced not only in this story, but in the entirety of Marvel's original Star Wars run. A wisecracking, seven foot tall, bright green, carnivorous rabbit, Jaxxon has the distinction of embarrassing even George "I thought Jar Jar Binks was going to be a breakout character" Lucas, who did not like the character and relegated him to the same place as the Star Wars Holiday Special, that small land where resides the handful of things Lucas wishes never existed. 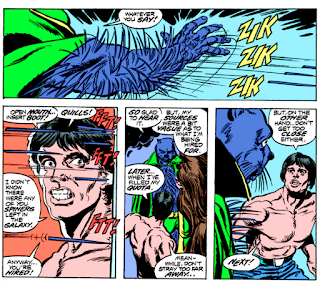 The villain of the story is Serji-X Arrogantus, who in name and visual design seems like a riff on cartoonist Sergio Aragonnes, though I have no idea if Thomas and/or Chaykin had any beef with the guy, or were just having fun at his expense. I don't believe any of these characters, with the exception of Jaxxon, appear again outside this story, but we'll see. Meanwhile, we see Luke depart Yavin 4 , along with Artoo and Threepio, on a mission to scout out a new Rebel base, on the grounds that Luke is the best pilot the Rebellion has left (which, given their losses attacking the Death Star, is probably true even despite Luke's actual skill). Luke's journey involves him thinking over the events of the film, which leads to a full page visual recap of sorts, something the series will trot out fairly regularly in the issues ahead. 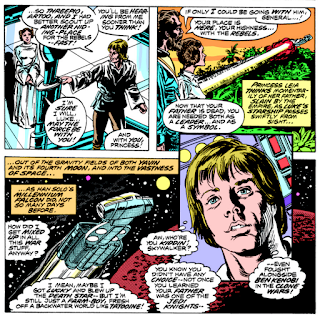 A note on the letters page states that with all the various reprintings of the first six issues, there's over two million copies of the Star Wars adaptation that saw print at the time. Tom Palmer, possibly my favorite comic book inker of all time, inks this issue. He'll stick around through the end of the story in issue #10, but returns later in the series for a longer run as the regular inker on the book. 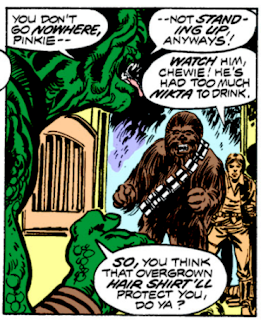 Chewbacca is starting to look a little more like his movie self in this issue. 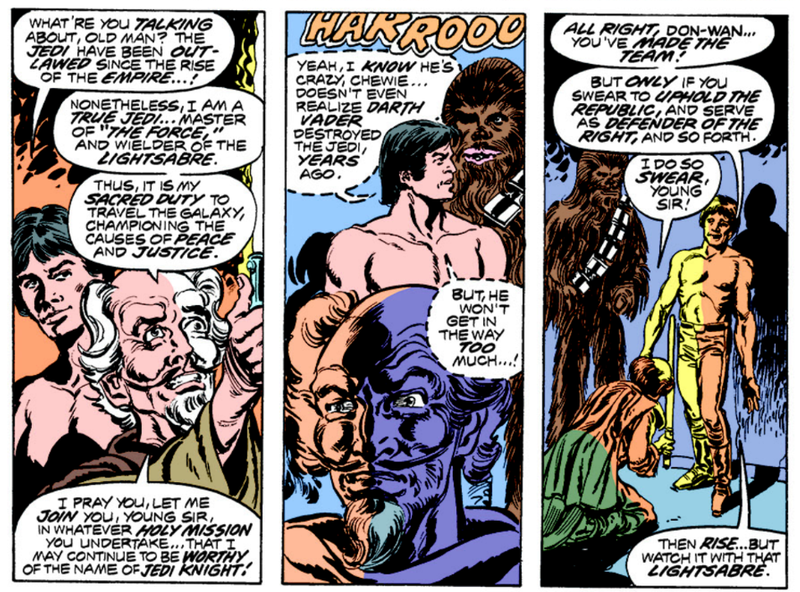 The three farmers/peasants who approached Han with a job offer last issue are decidedly less stereotypically Asian in this one, looking more like Luke Skywalker clones. Han refers to "Nikta" as a specific type of seemingly-alcoholic beverage. 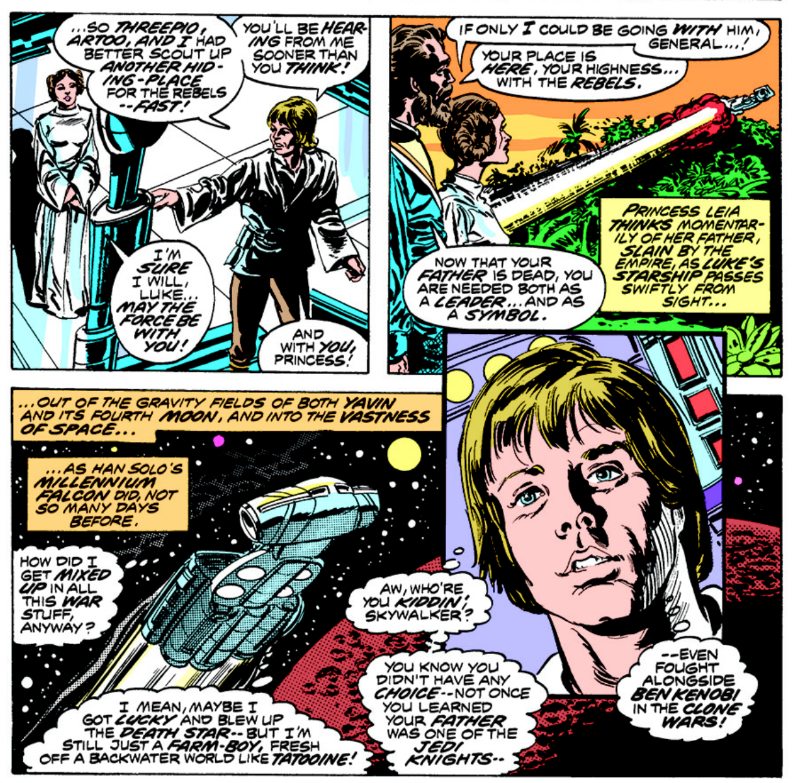 Amaiza refereances Han's works with the Black Hole Gang. She also refers to Jabba the Hutt with one "t", like Pizza Hut. Not only does Han take the job of protecting the settlers on the promise of very little money, he actually refuses Serji X's offer to pay him to walk away. 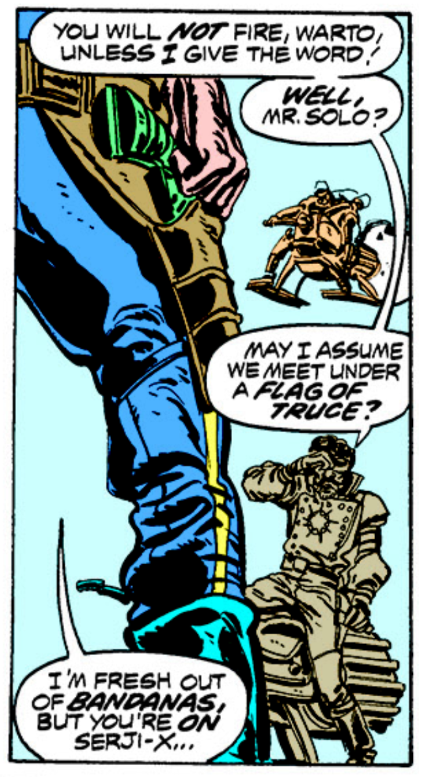 Han references bandanas, which seems like a hilariously-specific term, but maybe not. 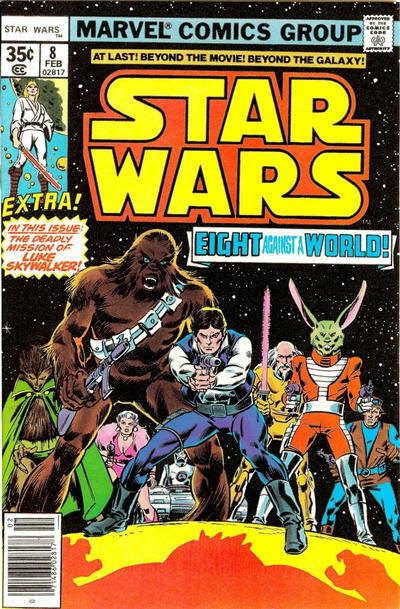 With this issue, Thomas and Chaykin embrace the Western influences they flirted with in the previous one, setting up what is basically a Magnificent Seven (a film with its own ties to Star Wars, of course) pastiche, as Han and Chewbacca assemble a team to defend a frontier town on Aduba-3 from a group of raiders. For the most part, it works, though it requires overlooking some squinty characterization and plotting to do so: the Han of A New Hope, who was reluctant to help the Rebellion even after getting paid, seems unlikely to take a job with little pay just for the sake of righting a wrong, especially after having just lost all that money he got from rescuing Princess Leia, while it's unclear how, exactly, Han and Chewie are planning on paying their new associates when they themselves are barely getting paid (it's also unclear why Han conducts most of the interviews shirtless). But what this issue is really remembered for is the introduction of Jaxxon, the infamous in-your-face green space Bugs Bunny. George Lucas is not someone known for his sense of humor, so it's no surprise he never took much of a shine to the character, but putting aside his concerns, Jaxxon still isn't a great character. His defenders claim he's fun, a relic from a time before the Star Wars license became over-managed. And while there's some truth to that, the problem is that, in execution, he's less fun than he is obnoxious, a proto-Poochy (or, if you prefer, a Mary Sue), aggressively in the reader's face, telling us how awesome he is (which then has the opposite effect). Thomas and Chaykin are clearly having fun with this arc and these characters, and there's nothing wrong that; in fact, this story, and Jaxxon, are charming in some ways. But there's also no denying that Jaxxon is an odd fit for the Star Wars universe, even this early in its existence, and while a humorous relic of his time, it's perhaps for the best that he never caught on and spent too much time rubbing shoulders with the likes of Luke Skywalker and Darth Vader. The Star-Hoppers go into star-action! > Then there's Amaiza, a blaster-wielding bad girl who has a past with Han. Well, it's a Howard Chaykin comic. OF COURSE there has to be a curvaceous woman traipsing around in lingerie (or the closest equivalent, thereof). 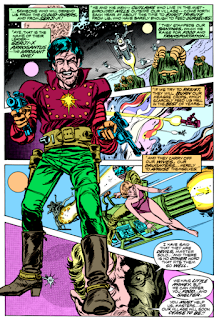 > The villain of the story is Serji-X Arrogantus, who in name and visual design seems like a riff on cartoonist Sergio Aragonnes, though I have no idea if Thomas and/or Chaykin had any beef with the guy, or were just having fun at his expense. No idea on that one. From the page posted, Arrogantus, certainly, bears an uncanny resemblance to Sergio Aragonés. 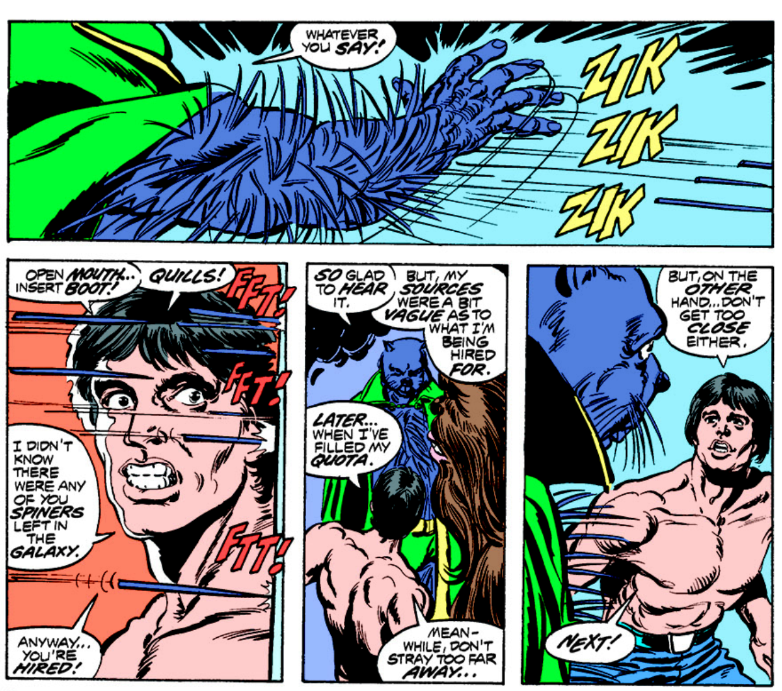 That might’ve been the weirdest thing in this issue — which is no small feat. Look, Star Wars was certainly not without its stock types and genre influences, but stuff like Jaxxon and Don-Wan Kihotay is way out of line with the movie’s tone. All due respect to Roy, mind you… He obviously had to go somewhere and probably got more guidance on what he couldn’t do than what he could. It’s a little painfully apparent, however, that despite his persistence in selling Marvel on the property he wasn’t as in tune with this material as he was with Conan. Palmer brings much stronger likenesses, so that’s a plus. Chewie looks a great deal more like himself — in the story, at least. The cover? Oy. If you squint it’s fine, but, off-model Chewie aside, Han’s gun is pointed so far to the left of the axis to which his stance is oriented it’s nearly at a right angle to the front of his body. I'm on board with the broad strokes of the plot but the characters are just so far afield of the film that it's hard to want to keep reading even for curiosity's sake. I asked Roy about Serji-X Arrogantus. 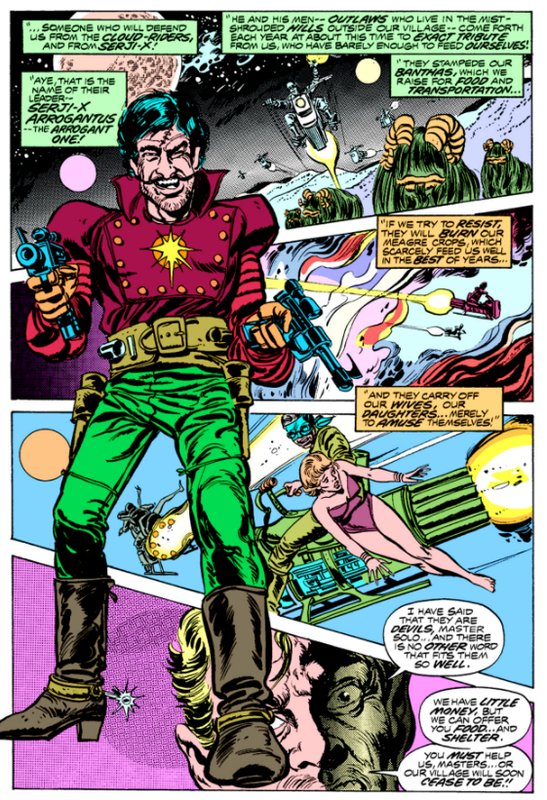 He replied: “I just thought Sergio would make a good space-bandito type.” I don't know whether anyone has "space-bandito" on their Marvel Star Wars Bingo card, but if decades-later author remarks count then you're welcome. Aragonés had been drawn into his own Western co-creation Bat Lash nearly a decade before. Glad you addressed Han's shirtlessness. I was puzzling over that quite a bit as I read this one. The thing that bugs me about Jaxxon is not necessarily his "Poochie"ness, though that's certainly irritating; but it's the fact that he consistenly refers to himself as a rabbit. It's one of those Earth-centric things that just pulls me out of the STAR WARS universe. Though honestly, Don Wan bothers me more. Don't mind Amaiza, though. She looks completely out of place in STAR WARS, but at the same time I don't think anyone would bat an eye if she were a Twi'lek mercenary dressed that way (if Twi'leks had existed yet at this point, of course). In general I'm with Blam, that Thomas's tone is just way too off. I can't wait until Archie Goodwin takes over the series. 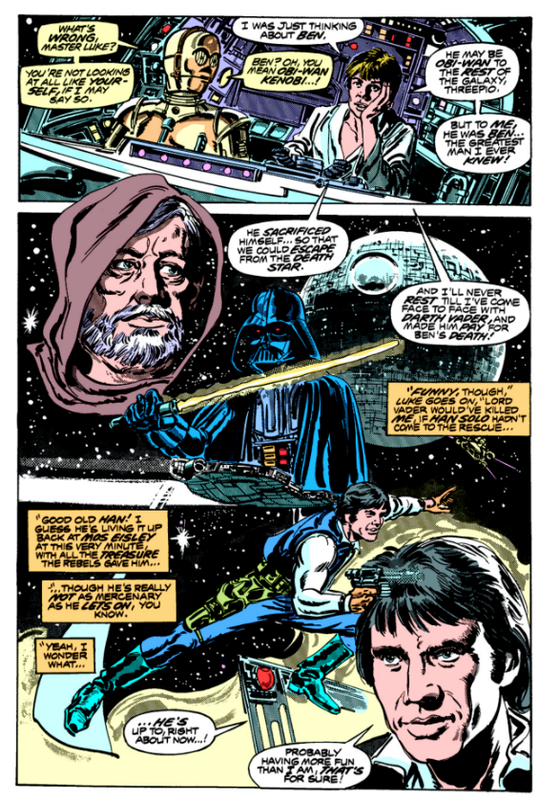 I haven't read his work on this title, but he sure had a good handle on STAR WARS in the newspaper strips. "Chewbacca is starting to look a little more like his movie self in this issue. "The three farmers/peasants who approached Han with a job offer last issue are decidedly less stereotypically Asian in this one, looking more like Luke Skywalker clones." I'm guessing both these developments are due to the arrival of Tom Palmer, since Chaykin is still penciling here, and he surely could've drawn Chewbacca correctly if he'd wanted. He may not have had reference photos for every last background character, but he must have had something for Chewie. Jaxxon was acceptable to 7-year old me, but looking back he's a real misfire. Perhaps if he'd been more petting-zoo people and less gunslinging Bugs Bunny? I've always enjoyed the 'Magnificent Seven' riff Chaykin had going here, at least since I got old enough to realize what it was. It would have been better if it were more subtle of course, but these were early days for Star Wars.